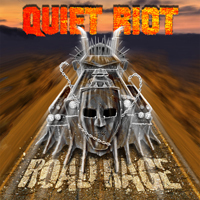 Heavy Metal veterans QUIET RIOT, lead by long time member, drummer Frankie Banali, release their first all new album, “Road Rage,” post Kevin DuBrow, who passed in 2007. The band also features QR III member Chuck Wright back on bass and American Idol alumni James Durbin on vocals. “Road Rage” was originally recorded with vocalist Seann Nicols and set to release earlier this year, however after his departure, it was decided to have new vocalist Durbin work to re-record the entire album. It would be interesting to do an album comparison between the two. Track three, “Roll This Joint,” is quite catchy and Zepplin – styled. The chorus provides the perfect canvas to showcase Durbin’s vocal prowess reminding people why he was an Idol’s favorite. “Freak Flag” is solid and heavy. This is the most “Metal” feel sounding track on the album… a dark anthem with an emotionally charged message… without a doubt my favorite song on the entire album. “Still Wild,” “Make a Way,” and “Renegades” all begin with that signature Frankie Banali drum sound… big and bombastic. Definitely a 70’s feel and groove with big chords and a solid back beat. Think of a concoction that would include some LED ZEPPELIN, FOREIGNER, BAD COMPANY and a little of this and a little of that… maybe a hint of UFO and just a tad of Sweet. However, “Renegades” is the heaviest of the trio and the most modern sounding that stands out from the three. “The Road,” track 10, is the album’s ballad… structured very much like the Metal ballads of the early 90’s made popular by the likes of Firehouse… so much so that it actually sounds like FIREHOUSE. To some degree, “Road Rage” can be look at as QUIET RIOT’s return, as this album’s release has received more interest than anything released by the band since “QR III.” Though in reality, they never really went away… albums were still released, tours were still booked and shows were still performed. There has been a constant revolving door of new and old members coming and going and coming back again. Yet the band QUIET RIOT continues. “Road Rage” however, may not be as lucky… there is just not enough gas. When an album is written with a core group, it is designed to fit that unit. When aspects of the album are then replaced, what was originally that core no longer exists. This to me this is the case with “Road Rage.” It was originally recorded with Nicols on vocals, written for his vocal style I would imagine. His departure forced the band to quickly bring in someone else, Durbin, to re-record those vocal parts. Though Durbin pulls them off, I would have liked to see what would have been if new songs were composed based around Durbin’s style and approach… written specifically for him. However, time and production costs already spent said otherwise… and we are left with what comes across more as American Idol karaoke performance than what should have been for this album. This is not at the fault of Durbin. He did what he needed to do to have the record ready for release. He got the job… kudos! My hope now is that he is given the opportunity to truly shine both on the road and on the band’s next album. Time will tell. I am routing for the band!